Question Time, the BBC's premier political debate programme chaired by David Dimbleby, was in London on Thursday 1 May. The panel included the Secretary of State for Defence Des Browne, the shadow foreign secretary William Hague, the former leader of the Liberal Democrats Lord Ashdown, the writer and author Richard Littlejohn and the journalist Polly Toynbee. 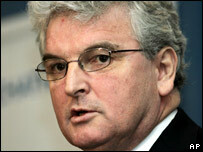 Career: Des Browne is the Secretary of State for Defence and Secretary of State for Scotland. He has been MP for Kilmarnock and Loudoun since 1997 and served as Parliamentary Private Secretary to Scotland's inaugural First Minister, Donald Dewar, before going on to hold a number of important ministerial posts, including Minister for Citizenship and Immigration and Chief Secretary to the Treasury. His time as Defence Secretary, which began in May 2006, has coincided with an escalation of sectarian violence in Iraq and last week he was forced to postpone highly publicised plans to reduce the 4,000 UK soldiers serving in Iraq this summer. He told MPs: "While the situation on the ground continues to evolve rapidly... it remains prudent that we take time to fully consider further reductions". 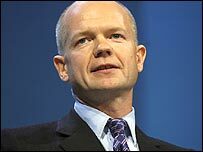 Career: William Hague is the shadow foreign secretary and former leader of the Conservative Party. After his first foray into politics, aged 16, with a speech at the 1977 Conservative Party conference, he was elected to parliament in 1989 as the MP for Richmond, North Yorkshire and was promoted to the cabinet as Secretary of State for Wales in 1995. He succeeded John Major as leader of the Conservative Party after Labour's 1997 election victory. On the morning of Labour's second landslide election victory in 2001, he announced his resignation, admitting: "We have not been able to persuade a majority, or anything approaching a majority, that we are yet the alternative government that they need." He spent some years as an active backbencher, notably speaking in favour of Tony Blair's proposal for military action in Iraq in 2003. He returned to frontline politics in 2005 when David Cameron made him shadow foreign secretary. Earlier this month he was able to reprise his famously lively performances at Prime Minister's Questions, taking on Labour Deputy Leader Harriet Harman in Gordon Brown's absence. He attacked pictures of Ms Harman wearing a stab-proof vest on a tour of her constituency, saying: "You had to explain yesterday that you dress in accordance with wherever you go - you wear a helmet to a building site, you wear Indian clothes to Indian parts of your constituency. Presumably when you go to a cabinet meeting you dress as a clown." 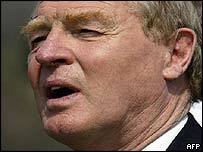 Career: Paddy Ashdown was leader of the Liberal Democrats from the creation of the party in 1988 to 1999. After retiring from British politics, he was made a life peer in 2001 and became the UN high representative to Bosnia and Herzegovina in 2002. Last year Lord Ashdown confirmed reports that he had turned down the offer of a cabinet post from Gordon Brown, saying: "You do not build partnership government by seeking to add the Liberal Democrats as a bungalow annexe to a Labour government." In January, it emerged that his proposed appointment as the United Nations super envoy to Afghanistan, supported by the UK, US and UN was blocked by the Afghan President Hamid Karzai. Lord Ashdown confirmed that he "almost did, but thankfully didn't" take up the role, saying he thought that Kabul opposed his appointment "partially based on my nationality and Britain's role in Afghanistan". Speaking recently of Britain's engagement in Afghanistan, he said: "You can defeat the enemy militarily on the battlefield but what we have to do is win the political battles... I'm not saying for a moment that we have lost. I'm saying that we're getting pretty close." 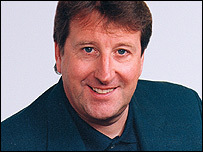 Career: Richard Littlejohn is one of the UK's best-known and most controversial commentators. Having spent over a decade as one of The Sun's most popular columnists, he now writes a twice-weekly column for the Daily Mail. In 1997, his column in The Daily Mail earned him the title "columnist of the Year" at the British Press Awards. In 2005, he was named as one of the 40 most influential journalists of the past 40 years when he was inducted into the inaugural Press Gazette Newspaper Hall of Fame. He is also the author of a number of bestselling books, the latest of which was Littlejohn's Britain, released in May 2007. Last week, he wrote: "There's a stench of decay about Gordon Brown, just as there was about the last knockings of the Callaghan government. Why are the backbenches and the unions cutting up rough now? Because they can. They can smell Gordon's weakness. They figure the game's up and they may as well make the most of it." Career: Polly Toynbee is one of the country's leading journalists, described by Boris Johnson in 2006 as the "fairy godmother" of New Labour. She was social affairs editor of the BBC from 1988 to 1995 before becoming a columnist and associate editor for The Independent. She joined The Guardian in 1998 where she is one of the newspaper's best-known writers. 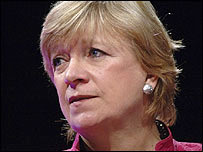 She hit the headlines in 2006 when Conservative shadow minister and member of David Cameron's inner circle, Greg Clark, publicly stated that rather than Churchill: "it is the social commentator Polly Toynbee who supplies imagery that is more appropriate for Conservative social policy in the 21st Century." The outcry from his own party led the Tory leader to confirm: "I have not and do not and will not support Polly Toynbee's policies." She has been a critic of Gordon Brown in recent months, calling on him to take a more "progressive" approach on issues such as the 10p tax rate. In her column this week she urged Londoners to vote for Labour mayoral candidate Ken Livingstone over Boris Johnson, saying: "Surely it's a no-brainer? Here is an effete and frivolous Tory only doing it for fun and fame. Never known for passionate commitment to anything but himself, his strongly right-wing views are contemptuously ignorant of all social policies."